Scots have been playing games bearing the name of "football" since the Middle Ages, especially in the isles of Orkney and Lewis and the Border region, where matches would be played between whole villages. 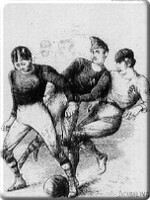 Many of these football-type games include carrying the ball and passing by hand, however, and bear little resemblance to modern association football. The modern game first took off in the nineteenth century in west-central Scotland, primarily in Glasgow and Dunbartonshire. 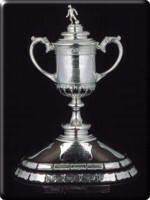 The trophy for its national cup, the Scottish Cup, is the world's oldest sporting trophy. Thir are the bewties of the fute ball. These are the beauties of football.]" Employers also wished to crack down on the game. In 1546, for example, the Company of Hammermen of Perth issued a decree that "neither servants nor apprentices" should play football "under penalty of a pound of wax" to reduce the number of absences accrued by injured employees. 1 This decree was not unreasonable: the passionate and dangerous game at times erupted into extreme outbursts of violence that included, on occasion, the use of firearms. In 1606 at Lochtoun, for example, some players "fell in contentioun and controversie, ilk anie with otheris, and schot and dilaschit pistolettis and hacquebuttis" during a "fute-ball" match. Football was indeed so rowdy that in 1656 Scottish Parliament forbade it to be played on the Sabbath. Violence continued to be a regular complaint about Scottish football games for many centuries, although the dangers associated with the game did little to quell its popularity. It wasn't until the late 1860s, when the game was standardized and modernized, that the dangers associated with playing began to wane. 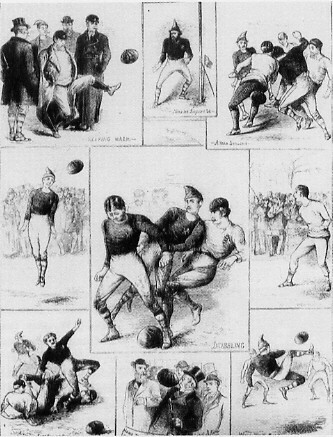 The Football Association of London developed the first rules of soccer in 1863, which began to discourage the handling of the ball, and Scotland soon followed suit. Queen's Park Football Club, founded in 1867, was Scotland's first football club, and is today the oldest existing soccer club outside England. The first official (meaning, currently recognized by FIFA) international football match took place between Scotland and England on 30 November 1872, at Hamilton Crescent Park in Patrick, Scotland, and was played according to Football Association rules. Although that match ended in a goalless draw and Scotland lost the following year's competition, it defeated England 4-2 in Glasgow in 1874. After drawing again the next year, the Scottish team ascended to dominance, losing only one of the next ten matches against England. The fierce rivalry that developed between the teams only fuelled association football's popularity. Over the course of the following decades, soccer developed into the most popular sport in Scotland. The Scottish Football Association, the second oldest football association in the world, formed in 1873. 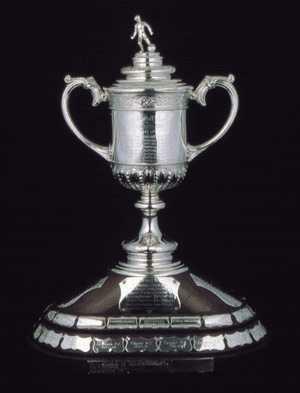 That same year it held Scotland's first national competition, the Scottish Cup, which was won by Queen's Park. Fifteen years later, William McGregor, a Perthshire native, founded The Football League in Birmingham, England, the world's oldest and richest professional soccer league. Because the game remained an amateur sport in Scotland until 1893, many Scottish players went south to play professionally in the late 1880s and early 1890s. James I's ban on football, which had remained in the records, ignored, for half a millennium, was finally formally repealed in 1906. Today football remains the most popular sport in Scotland and forms an intrinsic part of the country's cultural identity. 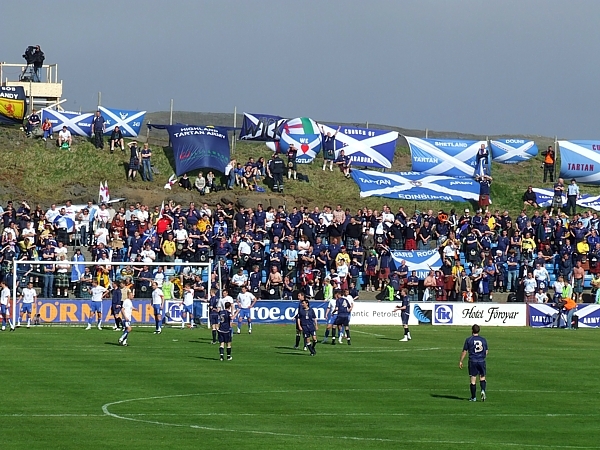 The Scottish national team has a large contingent of devoted fans known as the Tartan Army, a name that derived from the outfits the fans wore to international matches. 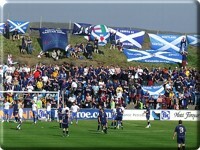 After earning a notorious reputation for hooliganism in the 1970s, the Tartan Army has cleaned up its act, and has won many awards from the Union of European Football Association and other football associations for its friendly nature, charity work, and vocal team support.